At this point in the presidential nomination process, voters usually start getting comfortable with at least some of the candidates who have been campaigning for many months. 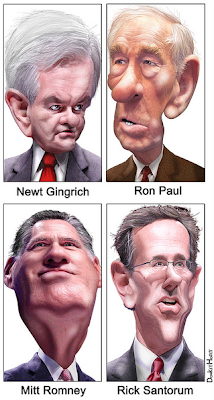 Republican voters have gotten to know their candidates and attending agendas pretty well by now. And yet, as the Pew Research Center found, rank-and-file Republicans are finding themselves less satisfied with their presidential choices, not more. As the Pew report, released today, explained, "In fact, more Republican and Republican-leaning registered voters say the GOP field is only fair or poor (52%) than did so in early January (44%)." In other words, this field of candidates isn't just unappealing to the party's own voters; it's increasingly unappealing. As Paul Begala recently observed, "When I look at the economy, I think Obama can't win, but when I look at the Republicans, I think he can't lose. The economy is starting to get better; the Republicans aren't." Amid a bruising primary campaign, Republicans remain unimpressed with their party’s presidential field. In fact, more Republican and Republican-leaning registered voters say the GOP field is only fair or poor (52%) than did so in early January (44%). By comparison, just 46% of Republican voters have positive opinions of the GOP field, according to the latest survey by the Pew Research Center for the People & the Press, conducted Jan. 26-29 among 1,006 adults, including 341 Republican and Republican-leaning registered voters. In early January, shortly before the New Hampshire primary, 51% gave the field excellent or good ratings while 44% rated the candidates collectively as only fair or poor. Who Understands Problems of Average Americans? Separately, the survey, in partnership with The Washington Post, finds that far more voters say Barack Obama understand the problems of average Americans than say that about either Mitt Romney or Newt Gingrich. More than half of all registered voters (55%) say Obama understands the problems of average Americans very or fairly well. About four-in-ten (41%) say he understands people’s problems not too well or not at all well. Only about four-in-ten voters (39%) give Romney high marks for understanding the problems of average Americans; about the same percentage (36%) says Gingrich does very or fairly well in understanding people’s problems. 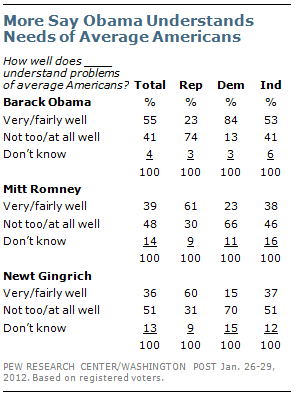 About half of independent voters (53%) rate Obama positively in understanding the problems of average Americans; only 38% and 37% of independents, respectively, give Romney and Gingrich positive ratings. Democratic voters overwhelmingly say that Obama understands the problems of average people (84%). 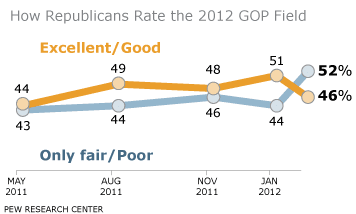 Smaller majorities of GOP voters give Romney (61%) and Gingrich (60%) positive ratings. Still A Path To A April 3rd Primary Election? AARP: Can We Still Vote? Is Section 5 On The Line Right Now?